Mullah Abdul Ghani Baradar, reported to have been captured in a joint US-Pakistani raid in Karachi, is one of the four men who founded the Taliban movement in Afghanistan in 1994. He is said to be second in command to the Taliban's spiritual leader, Mullar Muhammad Omar, who has been in hiding since the 9/11 attacks in 2001. As such, Mullah Baradar has been in day-to-day command of the Taliban insurgency. He is one of Mullah Omar's most trusted people, a senior Afghan official, who does not wish to be named, told the BBC. "His wife is Mullah Omar's sister. He controlled the money. He was launching some of the deadliest attacks against our security forces. His arrest will demoralise the enemy and affect their military operations", the official added. Pakistani journalist Rahimullah Yusufzai told the BBC that Mullah Baradar was in charge of the Taliban's military and political strategy and that his capture, if confirmed, would be a huge blow for them. "He was among the four people who founded the movement and we haven't heard about him for a long time," he said. "They will replace him, but that person will not have the same status." Interpol says he is also known as Mullah Baradar Akhund and describes him as the Taliban's deputy minister of defence - his role until the Taliban were toppled in Afghanistan in 2001. Mullah Baradar, like other Taliban leaders, is subject to UN Security Council sanctions, which include the freezing of assets, a travel ban and an arms embargo. He is also said to be a member of the Taliban's Quetta Shura, or leadership council, which is the movement's top decision-making body. The BBC's Ilyas Khan, in Islamabad, says Mullah Baradar has also been close to the Pakistani intelligence service, the ISI. However, although regarded as the commander of Taliban forces, Mullah Baradar is reported to be among those leading militants who favour talks with the US and the Afghan government. 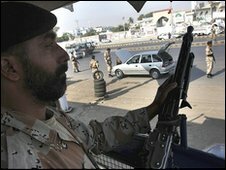 The first word of his arrest came in a report from the New York Times, quoting officials, which said he had been captured in a joint US-Pakistani raid in Karachi. Analysts say if his arrest is confirmed, it will be a significant moment. The US has claimed the Taliban have been operating from Pakistan, particularly the city of Quetta, something Pakistani officials deny. Little has been heard from Mullah Baradar since the Taliban were overthrown. However, in July 2009, he was reported to have engaged in an e-mail exchange with Newsweek magazine . Asked for a reaction to the US troop surge in Afghanistan, he said the Taliban wanted to inflict maximum losses on the Americans, which was possible only when US troops were present in large numbers and left their high-security areas. He also vowed to continue the "jihad" until "the expulsion of our enemy from our land". He claimed that Mullah Omar was in good health and leading the fight against the coalition, and denied Taliban leaders were based in Pakistan. Asked what would be the conditions for peace talks, he replied: "The basic condition is the withdrawal of foreign forces from Afghanistan."